‘must know’ licks from Ozzy’s legendary sideman! Let’s jump into Randy Rhoads style by learning 3 great licks from his playing. You’ll also learn 3 essential metal guitar scale shapes and pick up loads of performance and playing tips to help improve your rock guitar playing and technique. Randy Rhoads Style Lick 1. This lick is similar to one Randy Rhoads plays in his solo on the song ‘I don’t know’. We are using here a G blues scale shape at the 15th fret. Randy Rhoads Style Lick 2. This is a chromatic lick based on one little repeating idea which we move down the neck one fret at the time. It creates a tense and a bit dramatic sound, which Randy likes to use a lot. Randy Rhoads Style Lick 3. For this one we’re going to start at the 3rd fret using the G blues scale. This lick has two shapes, one at the 3rd fret and other at the 15th fret. What to do with these rock licks to get the most out of them? Experiment, jam, find your own little variations. Good luck! Get my awesome ROCK GUITAR LICK BUNDLE with full TAB and notation for all these Randy Rhoads style licks plus TAB for many of my other rock and metal guitar lessons! DOWNLOAD MY FREE ‘ROCK GUITAR LICK BUNDLE’ NOW! In this guitar lesson you’ll learn how to play 3 high energy Randy Rhoads style licks. You’ll also learn 3 essential metal guitar scale shapes and pick up loads of performance and playing tips to help you take your rock guitar playing and technique to the next level. Famous for his devastating guitar solos, classically influenced licks and his dedication to his craft, Randy continues to be a hugely influential player on generation after generation of guitar players. 0:13 Introduction. 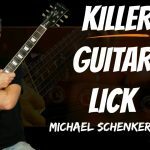 Hear me demonstrate ideas similar to the licks from this guitar lesson over a Randy Rhoads style backing track. These licks are based on his playing on the early Blizzard of Oz albums with Ozzy Osbourne. They’re all in the key of G minor and are from the G minor pentatonic scale, G blues scale and G dorian mode. 2:55 How to play the first lick. Broken down phrase by phrase for easy learning. The lick uses alternate picking to get that characteristic Randy Rhoads attack and punch but you could play it with hammer ons and pull offs if you prefer. 6:29 Randy Rhoads Style Lick 2 demo. This is a chromatic lick demonstrating an approach Randy liked to use. It comes from the G dorian mode played up at the 10th fret. Here you’ll learn how to play the scale pattern. 8:40 Let’s break down the lick. It consists of a repeating fragment of the dorian mode which is then repeated and moved down the guitar neck in 1 fret steps. This creates a slightly ‘outside’ sounding lick due to the notes it uses which are outside of the scale tonality. Palm mute it, alternate pick it and play it like you mean it! Also experiment with the concept of this lick in your own playing. Watch this position shift at speed – it ‘aint easy! Take it slow at first and get it accurate before speeding it up. Notice the addition of the dorian note at the 17th fret on the B string. 17:05 What to do with these rock licks to get the most out of them. Experiment, jam, find your own little variations. Good luck! Get my awesome ROCK GUITAR LICK BUNDLE with full TAB and notation for this video lesson and more!